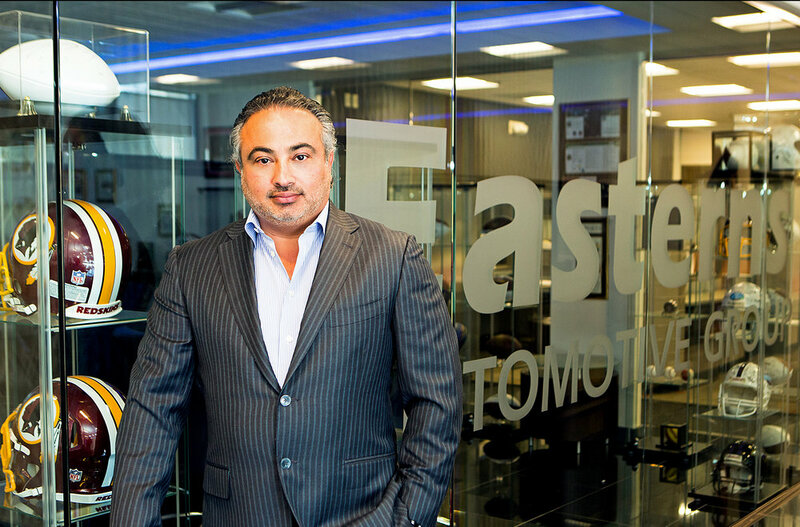 Robert Bassam is the founder and CEO of Easterns Automotive Group. Easterns is a Washington DC based group of 6 Used Car Dealerships, operated trough a centralized corporate facility in Sterling Virginia. Mr. Bassam moved to the DC area from Miami Florida in 1986 to work as a waiter in a Mexican restaurant. The spark to enter the car business came after a trip to the Salvation Army. He bought two cars there with his tip money for $50 each, and then sold them to co-workers for $300. After pooling money with a co-worker, Bassam bought 20 more cars and never turned back. Easterns, as a business, was established in 1988 during a short stint in the car wholesaling business. The first commercial dealership, located in Arlington Virginia, started after would-be buyers began shopping his wholesale storage lot looking for quality used cars. Many had been turned down by other dealerships in the area, and the trend was too obvious to ignore. He realized very quickly that the subprime market was underserved and mistreated, established the “Eastern Motors” brand as the place for second-chance credit. Using the slogan “Where your job is your credit,” the brand was established and he began adding stores to the operation soon after. Very quickly the dealership was booking over 100 deals a month with CAC and would expand his lender spread to include dozens of banks. In 2003, he signed up with Capital One Auto Finance, which would become the group’s top finance source, and Easterns currently operates with over 30 lenders, including lenders normally unavailable to non-franchises such as; Wells Fargo, TD Bank, Ally, AmeriCredit, and more. Bassam also holds national dealer advisory board positions with Capital One Auto Finance, Cox Automotive and Kar Auction Services. The Easterns Brand has continued to grow since inception. In the last 4 years new innovations and efficiencies in the Easterns structure have allowed the group to offer more competitive pricing while maintaining healthy gross levels. As a CEO, Bassam believes in doing things “better, faster, and cheaper” by centralizing operations and bringing business in house. Easterns operates central reconditioning and corporate facility in Sterling Virginia. This massive operation is all under one roof, a 90,000 square foot warehouse. All cars are purchased and fully reconditioned at this facility, and all corporate accounting, HR, tag and title, customer care, marketing, and legal work are handled there. The company also operates a single website and centralized Business Development Center, or Internet Sales department, which makes any of the companies 1,000 vehicles available to any customer at any location and handles all incoming and outgoing communication with customers. Easterns is known in the DC, Maryland and Virginia areas, or the “DMV”, for its catchy jingle and commercials staring celebrities and local athletes. This was recently featured on ESPNs Sports Center (See Here).You can see them all on their YouTube page here: https://www.youtube.com/user/EasternMotors. RBS Garage.com is the classic, custom, and exotic car collection of Robert Bassam, Founder and CEO of Easterns Automotive Group and Direct Car Buying. Robert has been collecting cars for over 20 years and considers it a sickness and a passion. He has made his living in the automotive industry and loves cars. Every one of these cars stored in a climate controlled 20,000 square foot warehouse, appropriately referred to as RB's Garage. Enjoy!